This week was all about the hellos. We said hello to our front rooms' future, hello to virtual reality that won't make you hurl, hello to a trio of fantastic new columnists and hello to more tech news than you can shake a stick at, assuming you're the kind of person who likes to shake sticks at news. First up, there's 2014K. That's what our ace new AV columnist Steve May reckons this year will be: "whether you want to create your own [4K video] or kick back and watch something more professional, it's all going down this year," he says, providing a guide to the most exciting bits of 4K kit from camcorders to stupidly large televisions. While everybody's clambering aboard the 4K bandwagon, some firms are already looking at the next big thing. 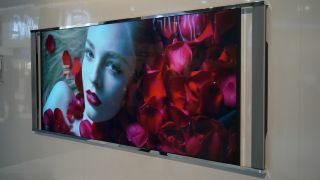 And by "big" we mean "really big": Toshiba's 5K TV concept is a whopping 105 inches, with an "insane" 5,120 x 2,160 resolution and a price tag higher than any human could possibly imagine. Will your 4K - or 5K - TV have a console under it? If it does, Valve would like it to be one of its Steam Machines. Not content with having 75 million PC gamers, Valve has its eyes on the console market. We've known about the Steam Machine for a while, but things are really starting to move now: the Steam controller has been given a significant redesign and the consoles should be on sale by September. Steam Machines won't just be about gaming, although of course that's their focus: this week we discovered that Valve wants the boxes to deliver other forms of media including TV, music and apps. As Lily Prasuethsut explains: "Adding these features puts Steam Machines even closer to their console competition." Just when we thought Valve couldn't possibly have anything else up its sleeve, we discovered that it's also been working on a VR headset - and according to Hugh Langley, "it's awesome." Developers say it's better than the Oculus Rift, it lacks the traditional VR feature of making you as sick as a dog, and because it uses markers around the room it can tell when you jump or crouch. Developer David Hensley says: "VR is going to be amazing." While Valve goes after the living room, the PlayStation's going after the PC. That's what our PlayStation Gamer columnist Rob Crossley reckons, floating the "absurd suggestion" that "Sony could soon open up its twenty-year vault of PlayStation software and hawk its goods to PC gamers." He's talking about PS Now, Sony's game streaming service, which means PlayStation gaming needn't be limited to PlayStation hardware. The idea of PS gaming on PC may seem fanciful, but "the brilliant thing about future technology is that it always seems unthinkable until it finally arrives." The world of Xbox may have been quiet by comparison this week, but it won't be for long. When it all kicks off again, our new Xbox Gamer columnist Aiofe Wilson - who claims to be Crossley's nemesis - will make it all make sense. Expect Xbox-related insights every Thursday and, once Titanfall ships, "the sound of my wicked sweet giant robot laying the smackdown on my enemies."